Which Are The Best Greek Islands for Solo Travel? 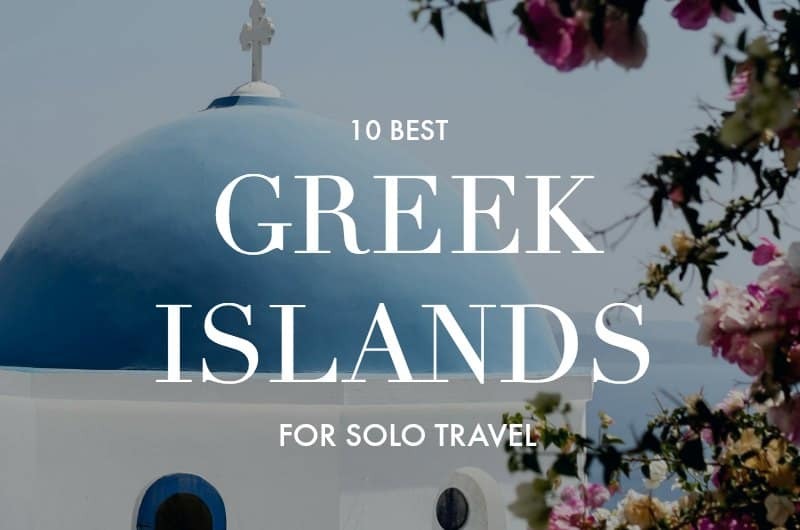 All of the Greek islands are amazing in their own way, but which are the best Greek islands for solo travel? I’m of the opinion that there’s no such thing as a bad Greek island for independent travel. In fact, it’s my firm belief that Greece is one of the best countries you can visit on your own. Greeks are ridiculously hospitable and friendly. And on a practical level, the tourist infrastructure is well-developed – it’s easy to get around and most younger Greeks speak English. A summer spent island hopping in Greece is surely one of the world’s greatest pleasures. 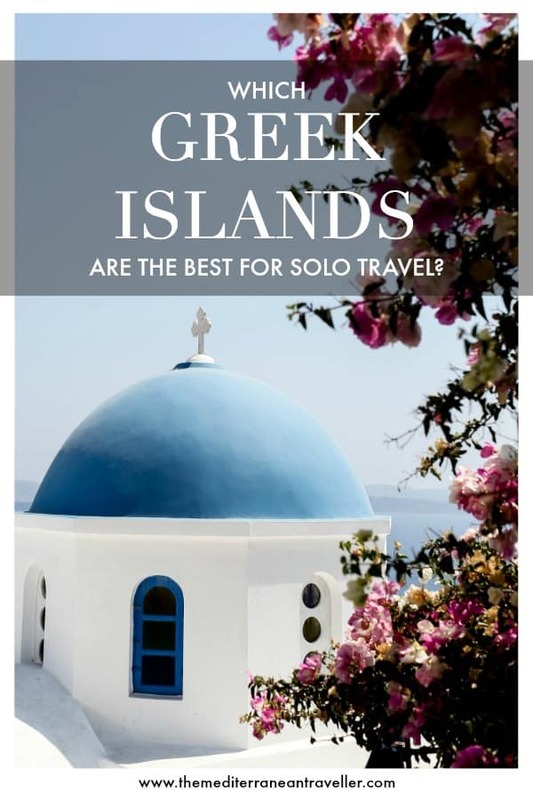 If you’re apprehensive about solo travel in Greece though, there are some go-to island choices where you’ll find everything you need for a stressfree solo trip – including hostels, cheap rooms/dorms, easy flight or ferry connections, friendly beach bars, a youthful nightlife scene, good public transport, and a range of activities and experiences suitable for solo travellers. Of course, all of the islands on this list have tourist areas where everything is available for you, but also more remote areas for getting off the beaten track. This is arguably best left unplanned – just hire some wheels and ask a local to point you in the right direction. Crete is the largest island in Greece so it’s no surprise it has something for everyone – and plenty for solo travellers. The island is divided into 4 regions, each with a main city where you’ll find hostels and nightlife. Crete is home to fascinating historic sites and some of the best beaches (such as the famous lagoons of Elafonisi and Balos) and hiking in Greece. The north is developed and home of the best resorts for nightlife; you won’t have to stray far for a party or organised excursions. There’s a good selection of hostels available if you want to be sure of meeting other travellers – check out Intra Muros in Heraklion, the stylish Cocoon City in Chania, and Rethymno Youth Hostel in Rethymnon. 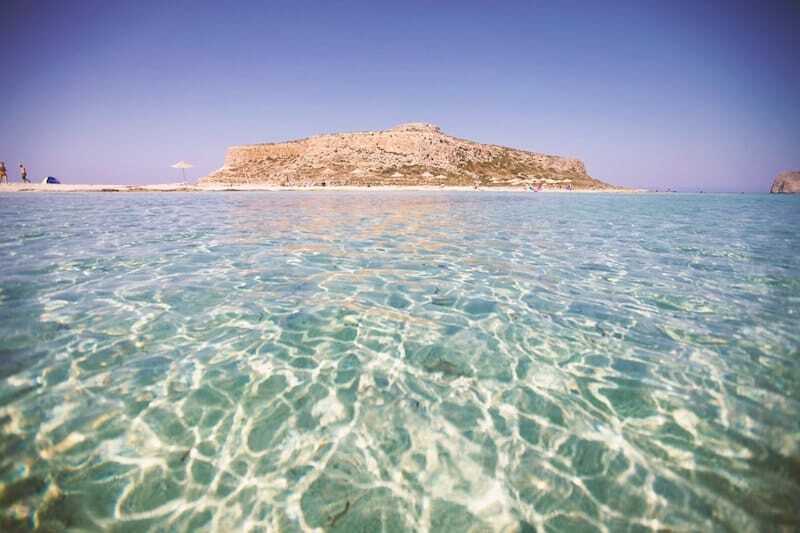 Crete is a land of ancient myths and wild beauty. Once you’ve let your hair down, hop on a bus to the island’s remote south for some exploration. Don’t miss trekking the Samaria Gorge; one of the best day hikes in all of Europe. It’s easy to arrange by public transport or organised excursion. 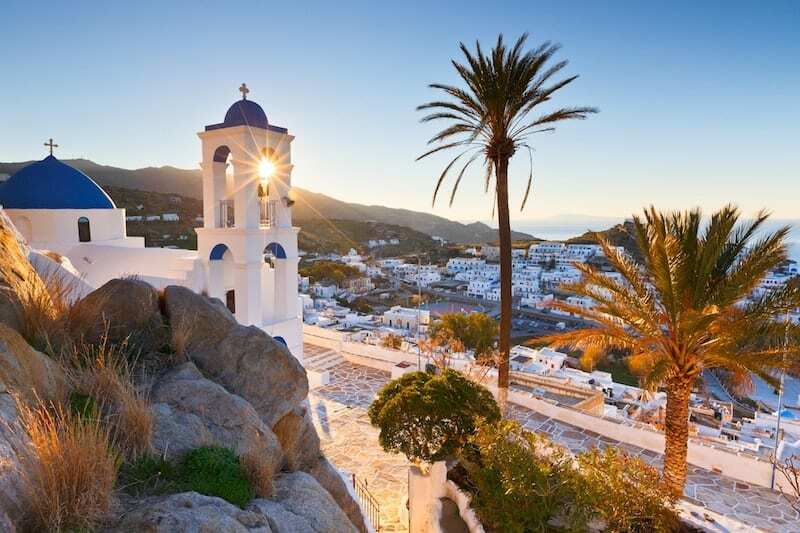 Cycladic beauty Ios is an ideal destination for younger travellers, being a well-established backpacker party zone popular with Australians and Americans travelling around Europe. Gorgeous sandy Mylopotas is the beach club hotspot for laidback daytime partying. As the beach clubs wind down in the evening, head up into the Chora to continue the fun. 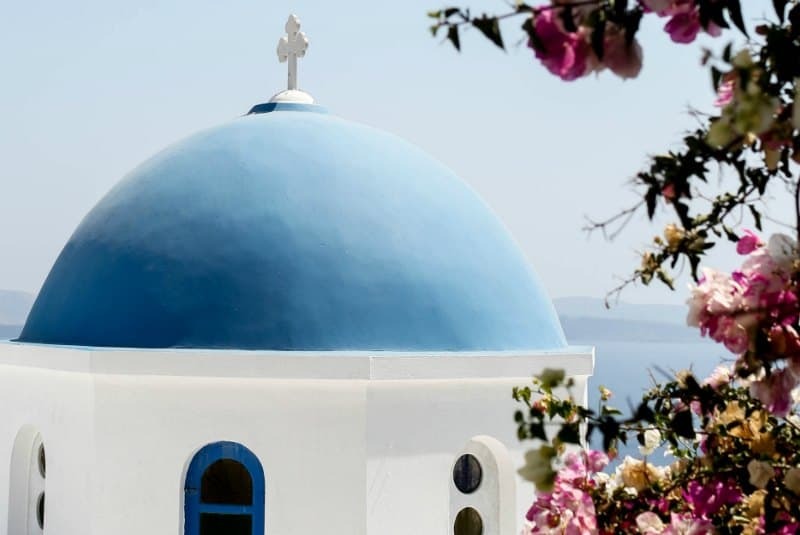 Ios has all the sugar cube villages, blue-domed churches and great beaches that you hope for from a Greek summer holiday, but at a lower price tag than ritzier cousin Mykonos. It’s easy to find budget accommodation, boat trips and ATV tours. Those seeking a slower pace will find it throughout the rest of the island, which is less developed and more popular with families and locals. Ios is an island that’s well suited to independent travel. For accommodation, check out Francesco’s and Far Out Beach Club. Iconic Santorini is the #1 destination of choice for many travellers heading to Greece for the first time. And it’s not just for honeymooners – solo travellers are well catered for too. Believe it or not, some of the best low-budget accommodation in Greece is to be found on Santorini. The prime example is the gorgeous Caveland hostel, which is set in a converted winery in Karterados. In the summer it hosts yoga sessions and BBQ parties. There are also some great value hostels in the black sand seaside resorts, such as Villa Kasteli and Youth Hostel Anna’s in Perissa. If you want something more central, try Fira Backpackers in the capital. It’s easy to get around Santorini by bus, but ATV tours are also popular. And there’s a huge selection of fun experiences including lush sunset cruises, cliff-jumping, the Caldera hike, volcano tours and wine tasting. Popular Mykonos is the home of glamour in the Greek islands, with a nightlife (and prices) to rival Ibiza. 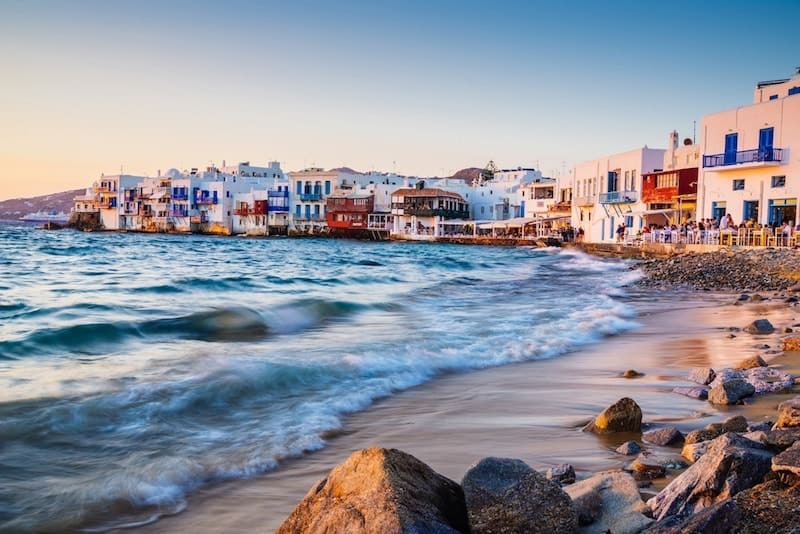 Take one helping of upmarket boho-chic partying and mix it with gleaming white Cycladic architecture and fine sandy beaches and you get Mykonos. Partying here is centred around Paradise and Super Paradise beaches and in Mykonos Chora. Of the two beaches, expect a more sophisticated vibe at Super Paradise and bigger beach parties at Paradise. Mykonos is one of the best islands in Greece for beaches – check out x and x to escape the crowds. Accommodation picks for solo travellers in the swanky new hostel MyCocoon has minimalist white Cycladic interiors, or for something a bit cheaper try lively Paraga Beach Hostel & Camping which is right on the beach, about 4km from town. Is busy Mykonos and Santorini seem too frantic for you, and you’d rather get away from the crowds and relax, consider a trip to Naxos. The fine sandy beaches are some of the best in the country. Naxos Chora has charming backstreets filled with tavernas and wine bars, and a crumbling Venetian castle. It’s hard to find accommodation in the old part of town, but just 5 minutes walk around the corner is the laid-back town beach Agios Georgios. There are plenty of cheap rooms in the streets behind the beach, which has excellent sunset views. Comfortable dorm beds are available at Soula Hotel, a stone’s throw from the beach. 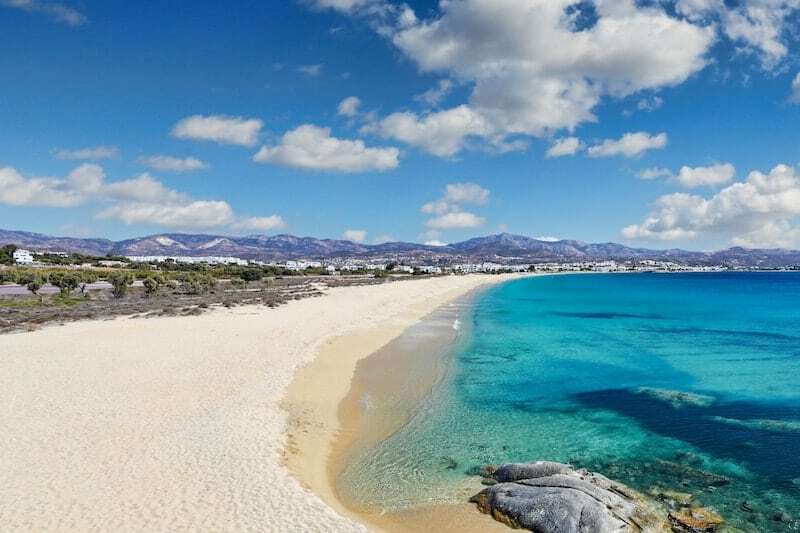 There’s plenty to do for the outdoors lover including water sports (Naxos is a top windsurfing spot), hikes up Mount Zas, and day trips to the nearby Little Cyclades. Prokopios and Aghia Anna are the best spots for beach bums. Naxos is one of the main hubs in the Cyclades island chain and so well-connected by ferry. It’s easy to combine it on an island hopping itinerary or use it as a base. For its spectacular Crusader castles, ancient ruins, golden beaches, and labyrinthine Old Town, Rhodes is hard to beat as the vacation destination that has it all. Rhodes is part of the Dodecanese chain and within spitting distance of the Turkish coast. So it’s an ideal destination if you’re looking to combine the two countries, or if you’re looking for an island to reach by plane (it has an international airport and plenty of domestic connections too). Buzzing Rhodes Town, with its immaculate medieval old quarter and student population, has a plenty of good value accommodation. My personal pick is STAY Hostel, which is the best hostel I’ve stayed at to date. Rhodes Town is well connected to the rest of the island. Take a day trip to pretty Lindos with its ancient Acropolis, or hop on a boat excursion to Anthony Quinn Bay. 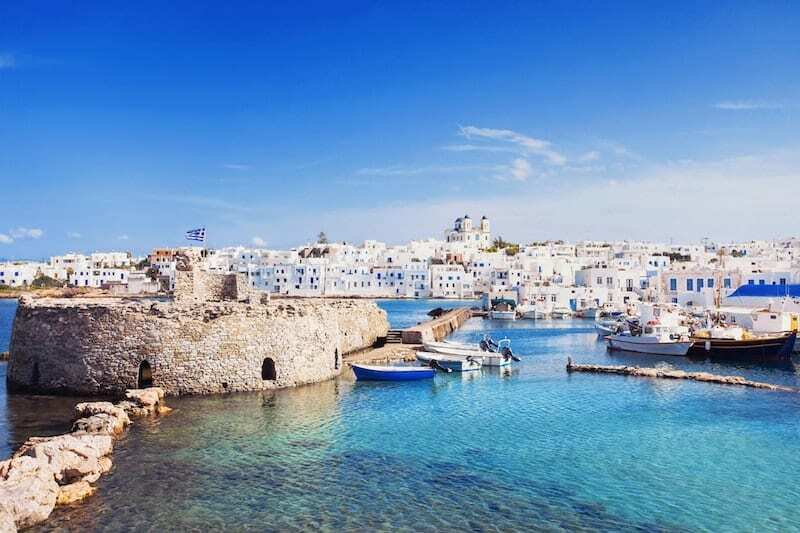 Once an unknown gem of the Cyclades island, Paros is becoming increasingly popular as an island destination to rival Mykonos and Santorini (or is easily combined with either). There are a plethora of discrete cocktails bars, cute tavernas and boutiques to discover tucked away in its gorgeous whitewashed towns, Naoussa and Parikia, which are popular with weekending Athenians. The water here is a stunning shade of turquoise, and the beaches are top notch. Head to Naoussa for low-key and sophisticated nightlife. Think chillout bars and blissful beaches. When it all gets too much you can hop on a boat to the tiny island of Antiparos, with its delightfully bohemian vibe. There’s a hostel in Parikia – Paros Backpackers – as well as a number of guesthouses offering dorms or cheap rooms. Corfu is undeniably one of the most different and interesting Greek island destinations, with its unique history, beautiful Old Town, and stunning lush and mountainous scenery. 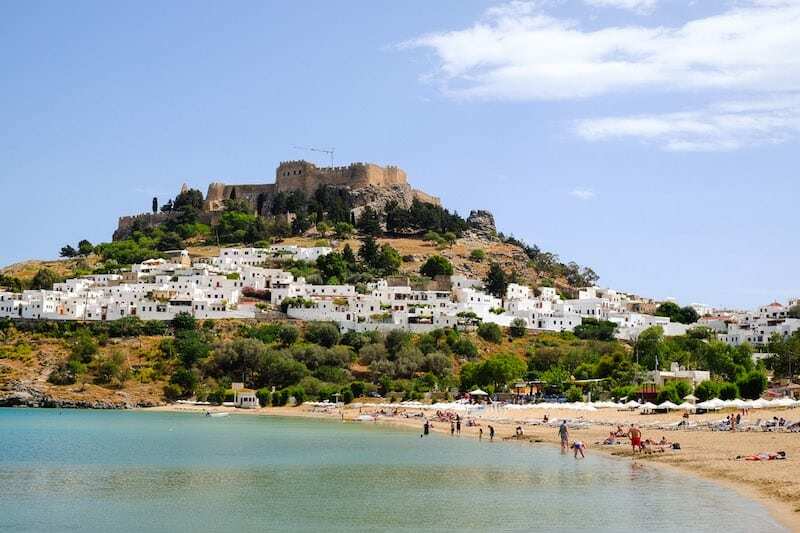 It’s one of the greenest islands in Greece thanks to its northerly position and more frequent rainfalls, which also mean it’s a bit less blisteringly hot in high summer than the Cyclades, for example. There are many beautiful coves tucked away in its rugged coastline, and some excellent hiking. There are no hostels in Corfu Town, where accommodation is limited. Instead, head to the numerous beach resorts which have been made over with bunks for solo travellers, such as Sunrock, Corfu Backpackers, or Maddelena’s. There’s also the Pink Palace Hostel, which was once the most notorious party hostel in Greece. It’s calmed down a bit since then – you’ll see some families staying there to take advantage of the low costs – but if you’re travelling on a budget it’s still worth checking out for Spring Break vibes in the idyllic Agios Gordios. Lots of organised excursions and boat trips are available. These days Zakynthos is mainly famous for one thing – the iconic Navagio Beach (or Shipwreck Beach, as its commonly known. This photogenic bay with rusted wreck resting in its golden sands, flanked by cliffs, is a big draw for foreigners. It’s probably the third most famous image of Greece, after the Acropolis in Athens and the blue-domed churches of Santorini. 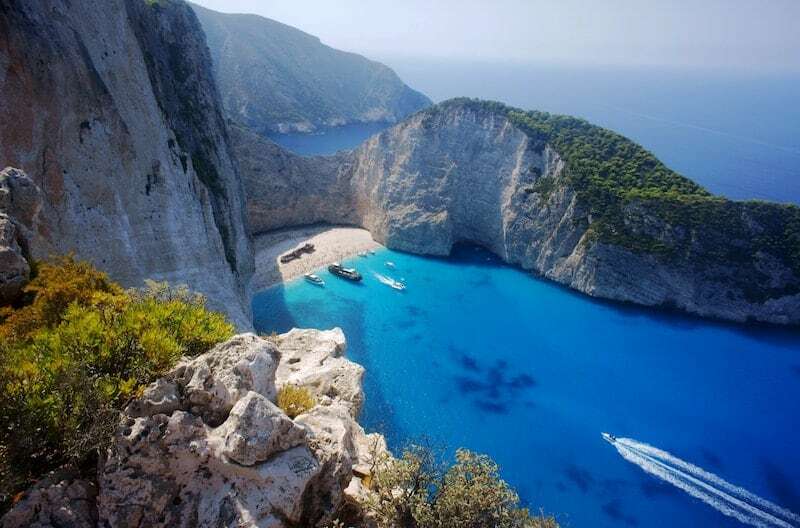 But Zakynthos (also known as Zante, its old Italian name) is much more Navagio Beach. It’s a popular island with holidaymakers thanks to its international airport, fantastic beaches and (in some places) thumping nightlife. Laganas is party central and popular with clubbers if that’s what you’re after. It can be carnage in peak summer. Head down the coast to Kalamaki for a more chilled experience (but still a short bus ride away from the action). 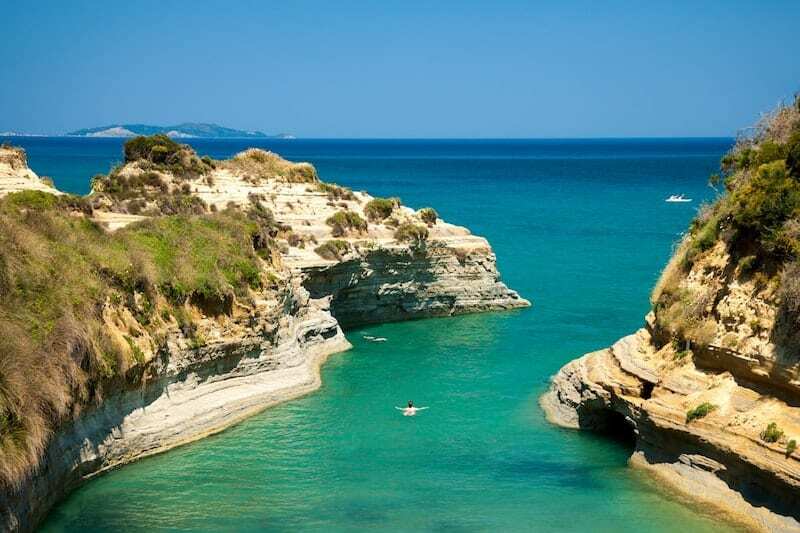 Don’t forget to leave the pool and explore the rest of the island – other beauty spots include Cameo Island, Gerakas viewpoint, Turtle Island and the cliffs of Keri. Away from the party zone, Zakynthos is a beautiful mountainous island – jeep safaris are a good way to explore the interior. Zakynthos is lacking a decent hostel but you should have no problem finding cheap rooms or Airbnbs outside August. 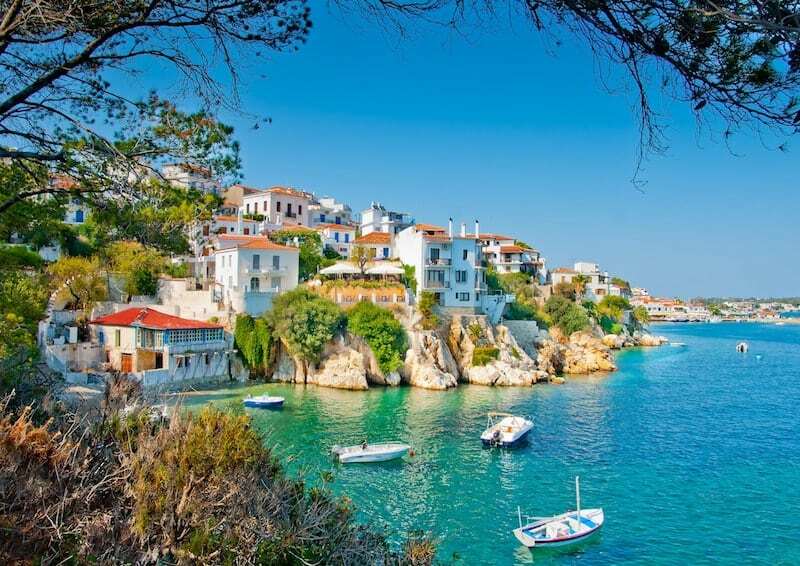 Mamma Mia fans looking for a solo break should make a beeline for the Sporadic island of Skiathos, one of the main filming locations for the ABBA extraordinaire. Skiathos is a big island and known for its summer nightlife. It has a laid-back, youthful vibe with lots of beach clubs and plenty of action in the main town. The journey from Athens is not the easiest – involving a 2.5hr drive to the ferry – but most travel agents sell a through ticket which includes the bus journey. Alternatively, you can fly to Skiathos, which is the main island in the Sporades chain. As you might expect from a filming location, Skiathos is stunningly beautiful and a perfect destination for long lazy summer days combined with fun nights out. It has pretty neoclassical architecture, fragrant pine woods and world-class beaches (you’ll want to check out Koukounaries, Banana Beach and Lalaria). And the nearby island of Skopelos is nearby for more Mamma Mia location hunting (this is where you’ll find the tiny clifftop chapel). There’s also Alonnisos, the smallest island of the Sporades, which is a National Park and protected marine zone – perfect for a snorkelling trip.